Arsenal make formal offer to sign Real Madrid star? 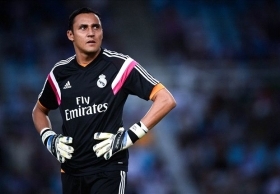 Arsenal have reportedly made a formal offer to acquire the signature of goalkeeper Keylor Navas from Real Madrid during the current transfer window. The Costa Rica international has largely played second fiddle to Thibaut Courtois at the Bernabeu this term and he has recently dropped a hint over an exit after saying goodbye to Madrid fans in an Instagram post. Since then, the shot-stopper has been linked with both Roma and Arsenal but according to Sport, the latter have made the initial move by lodging a £14m bid for the 32-year-old. Bernd Leno and Petr Cech have largely featured for the Gunners during the ongoing campaign but the latter's future remains in doubt with his contract expiring in six months' time. Owing to this, Emery seems keen on adding competition to Leno between the sticks and Navas has been identified as the prime option despite Damian Martinez providing the additional backup in the goalkeeping department at Arsenal.